BIONIC KIDNEY: ARE THEY READY FOR PRACTICAL USE? The term bionic had taken its peak in the popular culture thanked to the TV movie, and following series, “The Six Million Dollar Man” and its spinoff “The Bionic Woman” during the seventies. These shows, plus books, other TV series and movies, were in the science fiction field of that time, but the implementing of artificial limbs and organs have been taken into consideration for human transplant and limb substitution. After 40 years of research, the human race is getting closer to get the first Cyborg as many of the sources mentioned above have described through the years. Technology has brought to humankind several advantages in diverse gadgets, such as computers and smartphones; but it has not only been restricted to the communication area, the health field has also been benefitted from advances in devices. The application of bionic in medicine has shown great advances in human transplant and limb replacements; reflecting this advancements, artificial arms, legs, hearts, inner ear, and even eyelids are being developed through the years. The scope of this field has involved the medical research in order to improve the human condition to those who has suffered from accidents or diseases. Among these diseases, kidney failure represents the highest sickness in the human race history and its prevention and treatment has taken a great deal in research and development of artificial substitutes to help the patient. Due to the fact that the functions of kidney reach the dozen important ones, they can be easily damaged by the abuse of several substances, such as alcohol, and the constant use of the organ. When kidney failure gets to the point of critical condition, the patient needs to be taken into a process called hemodialysis. This process takes a long time and has to be taken frequently, so researchers have been working in providing an artificial replacement to the damage organ. Several groups in different parts of the planet have established studies related to the treatment of the disease and the improvement of the patient’s life. One of these devices is called dialyzer, a cylindrical device which cleans all the impurities of the body substituting the functions of the kidney. But this device requires long hours in the process, and the patient have to go through this treatment several times in a week. 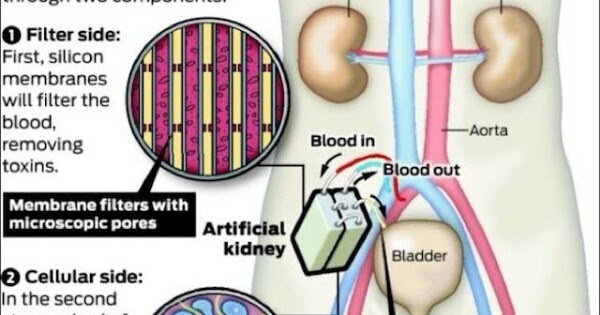 To avoid this treatment, some researchers are working in the creation of an implantable artificial kidney. This device is being developed by William H. Fissell IV, MD, a nephrologist from the Vanderbilt University Medical Center and Professor Shuvo Roy from the University of California. This artificial organ has been in development for more than a decade, but only in recent years it has received a good amount of money for its research. The device uses nanotechnology in its creation along with the usage of microchip that gives trustable and accurate functions similar to a natural kidney. The device was expected to be used in trial transplants at the end of 2017. Another device in development is the Wearable Artificial Kidney, nothing but a transportable dialyzer that can be used on a daily basis and carried by the patient in a pocket. The first clinical trial of a prototype designed by Blood Purification Technologies has been approved by the FDA, but it is still on the developing stage. Consequently, the practical use of an artificial kidney is still out of sight, but the developing of devices would provide the patients with a best quality life in the near future. From Nothing To Rs.1000 Crores, How Did Jaya Bachchan Become So Rich?